When I first launched Mr. Gelston’s One Room Schoolhouse in 2012, I was wrapping up my homeschool experience with my musician son. Although I had an undergraduate degree in psychology and a graduate degree in mathematics education, I had not received instruction in gifted education. It was revelatory to find the gifted community and understand our common journey. My teaching style, history in special education, and views on stress and anxiety made my services a good fit for gifted education. Families gave me great testimonials and nominated me to receive four SENG Honor Roll awards in 2014. Since then, I have become immersed in this world of giftedness; learning, getting to know the experts, and volunteering on the SENG Board of Directors. 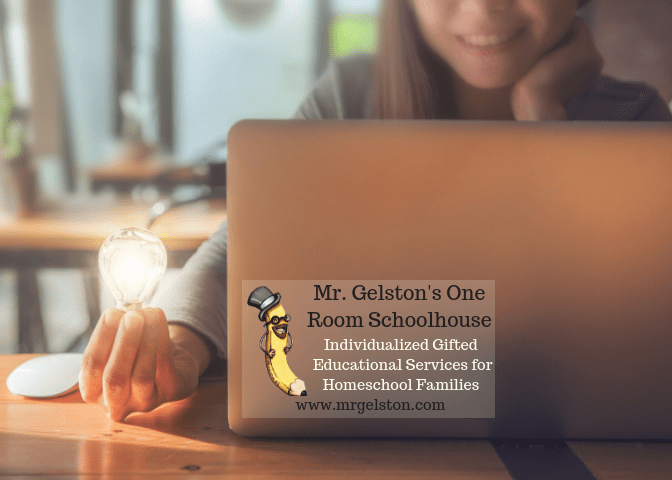 Mr. Gelston’s One Room Schoolhouse has come to encompass a set of values that are important to support the unique needs of gifted homeschoolers. Mr. Gelston focuses on the social and emotional needs of gifted homeschool learners and families. As an educator, I approach problem-solving with a joyful and positive attitude, utilize quality pedagogy, and continue to hone my subject matter mastery. Learning Coach – Carol Malueg, M.A., GCT, 2e – provides guidance and coaching for families and individuals as they develop social-emotional awareness, academic organization, self-management, and self-advocacy. Carol counsels students as they design their own strategies that work with their unique learning preferences and strengths. Carol is well known as the outgoing President of the Minnesota NAGC affiliate, MCGT and internationally as a SENG Master Facilitator and Trainer. Private Computer Science Lessons – Kathleen (Kat) Murray, MSE, CIS – is focused on working with gifted kids to take deep dives into the real world of computer programming and design. Kat understands that learning to code is just a first phase in becoming a professional programmer. Professor Murray has the background and depth of knowledge to bring your gifted child from an introduction to computing to become a computer science professional. Examining Current Events Through the Lens of History – Darby Kennedy, M.A. and gifted homeschool parent – is providing a course for a small group of gifted teens to examine current events and then take a deep dive into the history underlying today’s news. The focus is on examination and developing respectful debate.